In today's social-networked world, it can be tough to keep your personal information under your control. And given Facebook's dominant position, it's not so easy for start-up social networks to connect you with your friends, family and acquaintances. That's why a small start-up company named Micromobs has taken up the challenge of bringing simplicity and privacy to you in one click. As a start-up, Micromobs has been successful in growing as a community and company; perhaps your start-up can learn from them. I recently had the pleasure of visiting the Hacker Dojo in Mountain View, California, a community center and gathering place for hackers, thinkers, and future Silicon Valley mavens. While there, I met with Ajay Kamat, Himani Amoli, and Gordon McCreight, the creators of Micromobs, a company whose goal is to develop a social network that's easy to use and respects your privacy. They taught me a thing or two about running a start-up, and of course, they gave me some juicy nerd-details about their site. 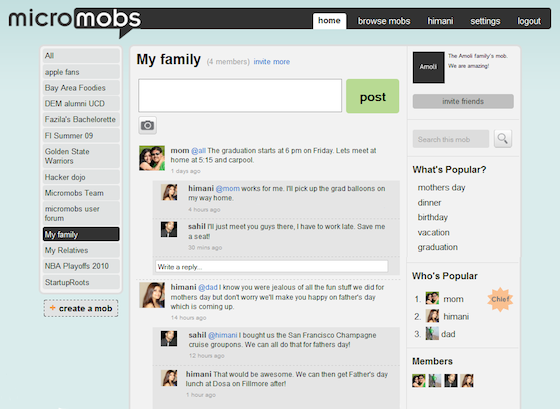 Micromobs is specially designed with social groups--like companies, work groups, clubs, friends, and families--in mind. The service lets you create a group (called a "mob") in one click, and log in using your existing Facebook or Twitter account. Micromobs's big draw is the privacy it offers: When you create a mob, you'll be able to control who is in the mob, and who'll be able to see what's posted to it. Compare this to Facebook, where, unless you're vigilant about locking down your profile, you never know who on the other side of the world is reading what you post. Also, joining a mob is 100% your choice; there's no forced opt-in as there is with Facebook's latest change to Facebook Groups. An example of a Micromobs social group, known as a "mob." When you do chose to join a mob, you'll be presented with a stream of messages--all relevant to that mob--from other mob members. Micromobs's creators made it very clear when I spoke to them that Micromobs is not just about privacy and simplicity, but also about context. Whenever you log on to Facebook or Twitter, you'll see a stream of posts that might not have anything to do with your interests. But when you go to your mob, you are more likely to see posts relevant to the original point of the group. And when you post in your mob, others in your mob are more likely to care about your post and are also more likely to respond, resulting in a more engaging discussion. As the founders say on the Micromobs blog, “mobs are for winners, [Facebook] groups are for spammers”You don't have to worry about friending on Micromobs; just worry about your group. Micromobs is also designed to be very accessible. You can respond to notifications directly from your e-mail account, and your response will post immediately to the mob you are responding to. Micromobs is also accessible via the browser on Blackberry, Android, and the iPhone, and SMS-forwarding functionality is coming soon. The creators say that they will likely work on applications for the phones in the future. Micromobs was able to become successful because of its creators' ingenuity, business style, and personal commitment to bringing a better networking site to the Web. According to the creators, part of the company's success comes from its summer intern program. For instance, Lionel Vital, a business intern from Stanford University, helped the company put together its business model and test various traffic and monetization strategies. Anuj Biyani, a technical intern from UC Davis, apparently learned Ruby on Rails in only two weeks, and also built a host of critical features which immediately went live to all of Micromobs's users. Finally, Jeff McNulty, a current Micromobs intern, is helping with the company's grassroots outreach campaign, and is responsible for bringing hundreds of new users to the site. Micromobs was able to find these interns in part because the co-founders were among the creators of StartupRoots, a program that matches top-tier students with Bay Area tech companies. "Focus on problems you experience in daily life. When you feel the pain point strongly, you are best enabled to build a good solution." "Find a great team. Starting a company is a difficult task. The people you have working with you will dictate whether you succeed or fail." "Right now is a fantastic time to start a company, especially a Web start-up There is a lot of opportunity, a ton of resources, and it is substantially cheaper than it has ever been." "Start your business in the Bay Area. There is no place like it for startups. You can work at a place like the Hacker Dojo for $100 per month and the is an endless supply of start-up competitions and networking events to help get your word out." Whether you run a gadget company or a social networking site, when it comes down to it, your success really comes down to only a few main points: Provide something that people need or want, stay motivated, find great people, advertise like no-other, and keep chasing that dream. Even if you don't have the funds, look into other options like interns, research fellowships, or venture companies. Micromobs did it, and so can you.